I love me some soup, especially when the weather starts cooling down. Here in San Diego, we have had a hot, dry few months but the last few weeks have actually felt a little like Fall (I am not thinking about the heat wave that's on the way for this weekend). I'm taking full advantage of the short reprieve from typical SoCal Fall weather and enjoying my soup while I can. This version of sweet potato soup is by far my favorite. It's rich, creamy and so filling, you don't need anything else with it for lunch or maybe just a small side salad for dinner. It's quick and simple and actually buying the ingredients will take more effort than making this soup. And you get so much out of it: it's high in fiber, vitamins and minerals. The cashews add protein and healthy fats. Soaking them beforehand helps with digestion and allows you to absorb more of the nutrients, but it's not a requirement. So much for so little? You can't beat that! Fill the bottom of a sauce pot with 2 inches of water. While waiting for the water to come to a rapid boil, slice potatoes into 1/2-inch slices or cubes. Place the potatoes in a steamer basket on top of the sauce pot. Steam until the potatoes are tender, about 5-7 minutes. While the potatoes are steaming, wash your carrot, removing the top and tip. Cut into chunks. 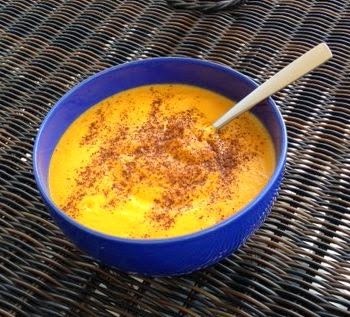 Using a high-speed blender such as a Vitamix, add your broth (or water), sweet potato, carrot and cashews. Turn the blender on and quickly increase the speed to highest setting. Blend until everything is combined and smooth, about 1 minute. Place the soup into bowls and top with chipotle. Yum!